Going into the grocery store and coming out with food that’s actually healthy for you has become as difficult as walking through a mine field. Ok, I can hear some of you saying how I’ve slightly embellished things – but have I? Unless the food you purchase at your grocery store is whole foods then you may be taking chances with your health. Of course anything in moderation is fine but let’s face it; all of us have our own definition of what moderation really is. A bag of potato chips every two days may be moderation for one person and once a month for another. Between additives, preservatives, artificial sweeteners, food colouring, and GMO’s there truly seems to be a war that’s been waged against human health. Those who do not read labels, those who do not learn what those ingredients really are could end up losing their health, and over time even worse, their life. There is no place for ingredients such as butylated hydroxyl toluene (BHT) in our food and especially in our bodies. BHT can act as a tumour promoter in certain situations and long term exposure may cause liver, kidney, and thyroid problems along with other nasty ill health effects. By the way, this additive is also in cosmetics. To read more about this and BHA check out David Suzuki’s website. I won’t overload you with all the nasty ingredients out there but I will talk about titanium dioxide. This has been classified by the International Agency for Research on Cancer (IARC) as an IARC Group 2B carcinogen ”possibly carcinogen to humans.” Four million tonnes of titanium dioxide is produced globally each year and it used in a huge number of products ranging from paints and solar cells to foods, toothpaste and medicine. Yes, medicine. Titanium dioxide is in Femara, a medication some breast cancer patients receive when they are in remission. If you are in disbelief about what I’ve written then check it out for yourself at CanoeHealth.ca (link is below). When you are at this link be sure to take note of the other ingredients in these pills. It doesn’t end there either. Earlier this month Marketplace aired an episode called ‘Food Safety’. Although I found it to be not inclusive of all possible factors, it was still good. For example, I learned that some grocery stores are mislabeling the fish that they sell. You may think you’re buying cod, but instead it’s actually pollock. Some people may argue who cares, fish is fish. No it is not. Cod comes from the Atlantic and pollock comes from the north Pacific; these waters are probably tainted with radioactivity from Fukishima. Marketplace never shared that with its viewers. Be sure to take the time to watch Food Secrets. Never has there been a time in which you must do your own research when it comes to food, drugs, vitamins (yes, vitamins as well), and cosmetics. I created a sheet of ingredients and other items to avoid in a grocery store so people can take it with them when they grocery shop. You’ll see two files that you can download for free on my website that can help you learn about what you’re really eating. Eating wild edibles harvested from safe locations has become a way of life for thousands of people across Canada and the United States. This was once the only source of plant-based food for thousands of years so eating wild edibles is really a good thing. Not only are they a source of food, nutrition levels are very high in most of them; so high in fact when you eat a steady diet of them chances are you do not need to take supplements. Yes, many of them taste bitter when raw, but bitters are what our liver needs in order to properly perform its 500 daily functions. When the liver is not in tip top shape there is a plethora of health problems that can develop. If you want to learn more be sure check out all of EdibleWildFood.com. You can also “like” EdibleWildFood.com on Facebook and follow us @EdibleWildFood on Twitter. 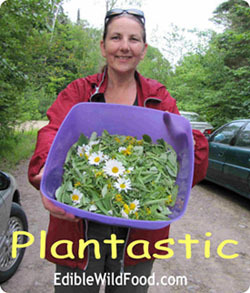 Learning to eat wild plants is simply plantastic! The adulteration of our food supply, in attempts to “improve” it, has been, in my opinion, one of the biggest mistakes in history. Nature cannot be improved upon; it remains in perfection, and can at best be only mimicked by human endeavors.